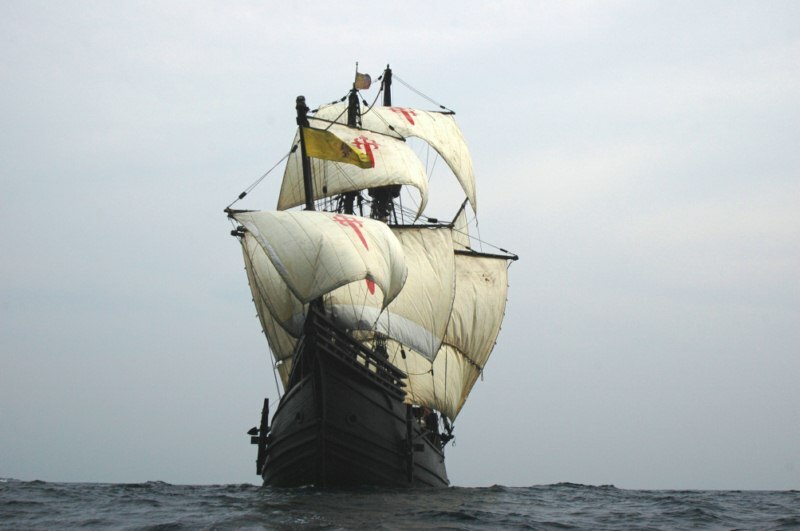 In 2019 Spain celebrates the V Centennial of the expedition of the first round the world of Fernando de Magallanes and Juan Sebastián Elcano, an event declared of public interest by the Government of Spain and whose program of activities is articulated by a commission organized by the Ministry of Culture Culture. Acción Cultural Española participates in the commission and organizes a program of activities on this important milestone in the history of Spain. These include the exhibition "The longest journey", a reflection on the attitude of man before the journey and the unknown that connects the first round of the world of history with the individual challenges of the present and the collective challenges of the future. On August 10, 1519 two hundred and fifty men departed from the port of Seville aboard five ships called Santiago, San Antonio, Trinidad, Concepción and Victoria. 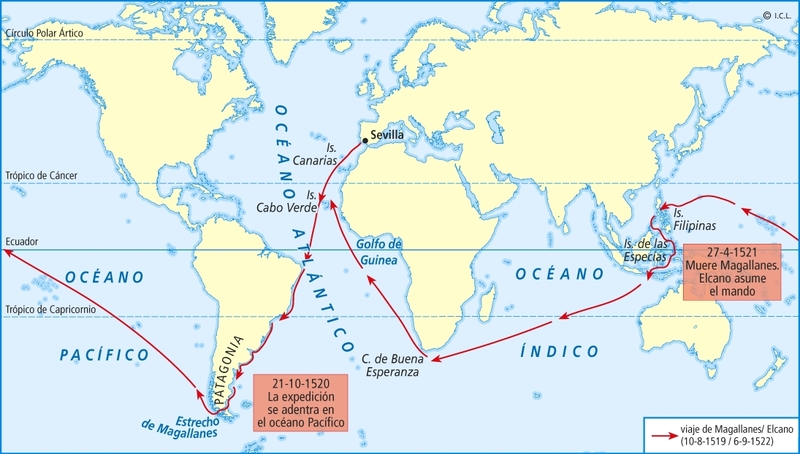 This expedition, known as the "Armada de la Especiería", took to the sea led by Hernando de Magallanes with the aim of finding the unknown passage between the Atlantic and the Pacific and reach the islands of spices sailing west. The expedition traveled the South American Atlantic coast to the unexplored southern end, discovered the mythical passage between the two oceans, crossed the Pacific Ocean for the first time in history and reached the Moluccan Islands, its objective. By then his captain had died, more than two-thirds of his crew had been lost and three of the five ships had disappeared. Only one ship, the Nao Victoria, would set off on the way back through the Indian Ocean. The other ship, the Trinidad, would try to return by the Pacific road without success. La Victoria sailed for months without stops along the route of the "roaring forties", climbed the Cape of Good Hope and ascended the Atlantic, after a brief and dramatic stopover in Cape Verde, to the port that saw her depart: Seville. He had only 18 men on board. The Nao Victoria had completed the First World Tour of History. The first round the world is perhaps the greatest maritime adventure of all time, a technical and human feat whose drama exceeds the limits of the imagination, but above all - and this fact is sometimes hidden behind the sensational adventure - is a key event in history, it is the epilogue to a series of ocean voyages that, starting from the Iberian Peninsula, revolutionized human knowledge and created the foundations of the modern world. When returning to the starting point after sailing always to the west, the Nao Victoria unites the great oceans of the earth; It definitively closes the image and dimensions of the world and man becomes real aware of the planet on which he lives. From then on, the borders would be already others. The first round the world is the symbol of a time when the will, the audacity and the desire to know about man impose themselves on fear and the emptiness of the unknown, but it is also a symbol of the most ultra, of the attitude of the man of all times before the border and the challenges of exploration. The first round the world is, in itself, a metaphor for all journeys: from great collective challenges to small individual challenges. The squadron departed from Seville on August 10, 1519, leaving the pier of Las Mulas, on the Guadalquivir River, near the west side of the current San Telmo bridge. The fleet descended through the Guadalquivir until reaching its mouth, in Sanlúcar de Barrameda (Cádiz), port of the Atlantic Ocean.